Here’s a refreshing set of words strung together. Nokia Lumia 800 is selling well! Something that has plagued Windows Phone is that it wasn’t attracting the sales. It was the unknown against the familiar greenbots and iThings. Sales folk didn’t know what it was so certainly consumers won’t be informed any better. It did lack apps, as was in first iteration still needing to mature (as well as wider spread app store, language support and improved hardware). A worry was – what on earth could Nokia bring? Could they really sell Nokia with Windows Phones? 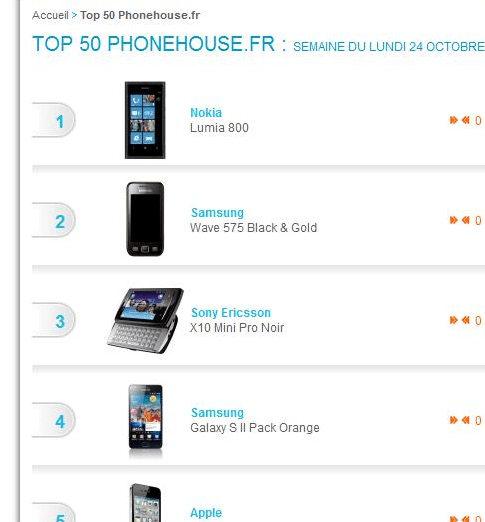 According to windows-phone7.fr, Nokia can bring it. They can sell Nokia Windows Phones. Nokia Lumia 800 has topped the chart of Phone House (Equivalent of CarPhoneWarehouse in the UK). As we always introduce it, that is the LARGEST independent mobile phone retailer in Europe with 1700 stores. More amazingly, this is BEFORE the huge marketing push. Before the new sales team that are taught what to showcase, before the Lumia 800 ads and promos. What more when that arrives? « The Nokia Lumia 800 Rant. It isn’t for everyone, BUT it is an attractive option for the majority and an amazing job from Nokia.